A robust and reliable gas-leak detection device, Searchzone Sonik will efficiently “hear” the loss of containment of any high-pressure gas within its listening zone. As it responds to the ultrasonic sound pressure level produced by pressurized gas leaks, it is therefore unaffected by environmental conditions. Searchzone Sonik is factory calibrated. Its robust sealed design with no moving parts and the advanced solid-state sensor allow for mounting in any orientation, even in the harshest environments. The acoustic gas leak detector will respond quickly to a gas leak within a sensing range radius of typically 20m (65 ft), dependent upon background noise. No False Alarms – the high-end spectral analysis delivers best-in-class detection of high-pressure gas leaks in real-world environments. 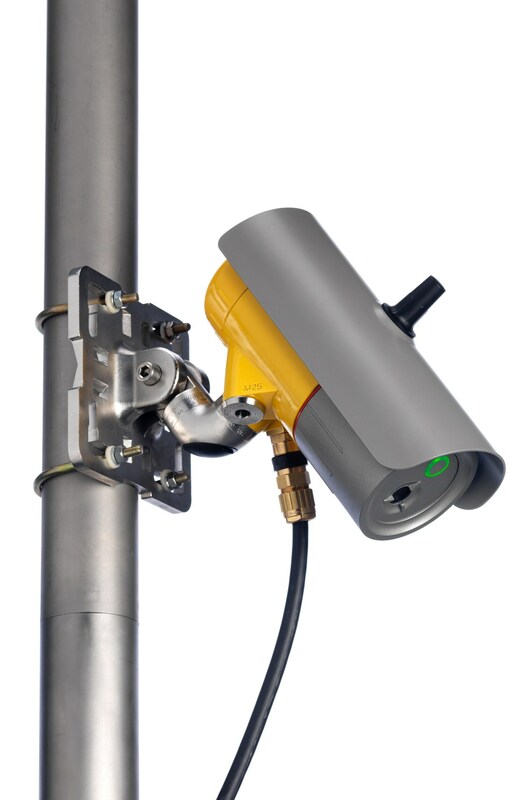 Wide Zone Coverage – typically 20m (65 ft) detection radius, dependent upon background ultrasonic noise levels. Complements Existing Gas Detectors – the Searchzone Sonik seamlessly integrates with existing point-and-open path gas detectors, thus creating the optimal gas detection mix. No Moving Parts – the solid-state sensor works flawlessly even in the harshest environments and doesn’t need additional calibration. Simple Installation and Alignment – the Platform Universal Mount with 3 graduated degrees of freedom enables easy mechanical set-up. Bluetooth Compatibility – set-up and interrogation from ground level are available via Bluetooth by using the Honeywell Platform application on IS mobile phones. Depending on the mobile device, the range can reach up to 20 m (65 ft). Instrument Status at a Glance – the Searchzone Sonik features a bright signal light – green, yellow, red, or blue - providing clear indication of the instrument status. Full Operational Logs – enables post-event analysis to assess overall performance and allows security checks. Fast Commissioning – the Searchzone Sonik App allows users to save configurations and upload to other Searchzone Soniks for quick and easy commissioning.